5ml sample bottle (approximately 83mg of full spectrum hemp derivative) of our Kentucky-grown, farm fresh full spectrum hemp derivative oil. Naturally rich in terpenes, Omega-3, Omega-6, and Omega-9 Essential Fatty Acids. 5ml sample bottle (approximately 83mg of full spectrum hemp derivative) of our pure, organic, Kentucky-grown, farm fresh full spectrum hemp derivative infused with Copaiba and Peppermint essential oils. Naturally rich in terpenes, Omega-3, Omega-6, and Omega-9 Essential Fatty Acids. The 500mg Mint has a deep green color and robust, natural & fresh flavor; you can taste the goodness in every drop. 5ml sample bottle (approximately 83mg of full spectrum hemp derivative) of our pure, organic, Kentucky-grown, farm fresh full spectrum hemp derivative infused with Copaiba, Sweet Orange, Clove Bud, and Cinnamon essential oils. Naturally rich in terpenes, Omega-3, Omega-6, and Omega-9 Essential Fatty Acids. The 500mg Spice has a deep green color and robust, natural & fresh flavor; you can taste the goodness in every drop. 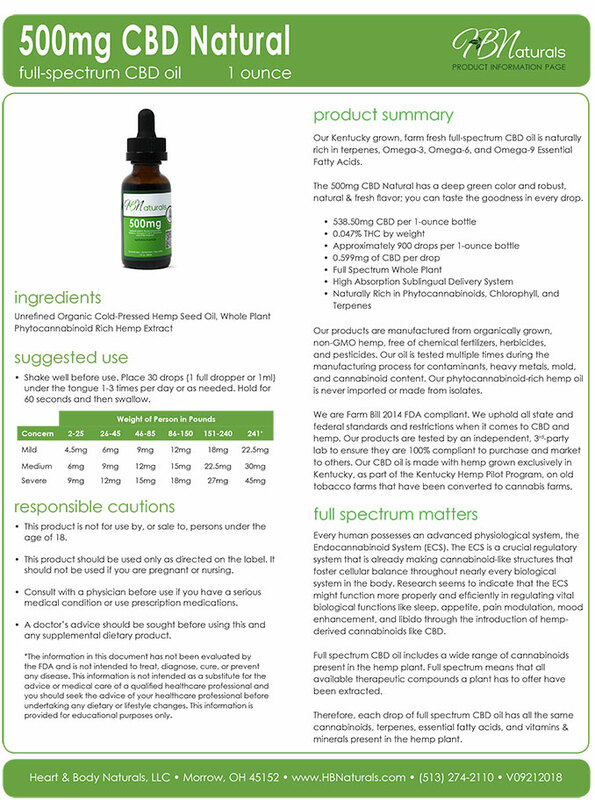 5ml sample bottle of Entourage, a synergistic blend of eight phytocannabinoid producing plants. Combined, they create the phenomenon known as the "entourage effect". This occurs when the natural constituents found in a plant interact together and with the human body to produce a stronger influence than any one of the plants used alone. When we combine multiple compounds in their natural state, we don't end up with the sum of the parts; we get a multiplying synergistic effect instead. For many years most scientists, believed that cannabis sativa was the only plant able to produce cannabinoids that activate the endocannabinoid system. Thanks to research in the last few years we now know cannabis is not the only plant that produces life-enhancing cannabinoids! In fact, just about every clinical study related to the health benefits of Cannabis sativa has also been done on its power-packed cousin, Nigella sativa, with similar powerful results! Entourage test results coming soon. 7-Day Trial of the Healing Trilogy, Mind, Body & Soul, formulated by world renowned and gifted healer Alexandria Brighton with science-backed ingredients shown to reduce internal inflammation. Add ½ teaspoon MIND to milk, juice, smoothies, etc. Can also be sprinkled on your favorite yogurt, cereal, or salad. May be sweetened to taste with preferred sweetener. Shake or mix well. May be taken up to 2 times daily. Add ½ teaspoon BODY to milk, juice, smoothies, etc. Can also be sprinkled on your favorite yogurt, cereal, or salad. May be sweetened to taste with preferred sweetener. Shake or mix well. May be taken up to 2 times daily. Add ½ teaspoon SOUL to milk, juice, smoothies, etc. Can also be sprinkled on your favorite yogurt, cereal, or salad. May be sweetened to taste with preferred sweetener. Shake or mix well. May be taken before meals to support digestion. 7-Day Trial of NOURISH Superfood & Sprout Shots, an organic, NON-gmo live wholefood supplement that your kids will feel and love! In fact, we're not quite sure who will love it more... you or your kids! Make Tonight a Sesso Dolce Night! With Sesso Dolce, the arousal happens very quickly, usually within minutes. It's your organic and safe solution to dramatically increase pleasure during intimacy. Most topical intimacy enhancers on the market address only blood flow by attempting to create increased sensitivity by causing irritation to sensitive tissues. Unlike most intimacy enhancers, Sesso Dolce does not force your body into sensitivity but allows the body to experience its natural ability to become aroused, which creates a much more fulfilling and pleasurable experience. Each essential oil in Sesso Dolce was selected for its ability to increase blood flow, provide warmth, and to help promote a healthy hormone balance, naturally, without the use of synthetic chemicals or drugs. Sesso Dolce not only increases the blood flow but does it gently and without irritation. Sesso Dolce should be applied before intimate activity. Increased sensitivity and arousal will start immediately and may last for one hour or more. Step 1: Apply 3 - 5 pumps of Sesso Dolce directly onto the intimate area of choice. There are approximately 12 applications in each container of Sesso Dolce. Step 2: Massage the cream directly onto the intimate area of choice, massaging it in thoroughly and gently in a circular motion. You will experience a warming sensation as you rub the cream in completely. Do not use if you are pregnant or have a yeast infection. Not for internal use. Do not drink. Sesso Dolce has a warming effect; if you experience a strong burning sensation, irritation, or rash discontinue use and wipe the area with a tissue soaked in olive oil. Consult your physician if necessary. Do not get Sesso Dolce in your eyes. If you should get it in your eyes follow the procedure listed above for irritation. May not be compatible with latex condoms. Do not use condoms that have chemical additives coated on them as the chemicals may react with the essential oils and cause irritation. Note: Sesso Dolce is not a contraceptive or spermicide. Sample of Slimmer, a synergistic blend of clinically studied ingredients to flatten your belly, get rid of toxins, speed up your metabolism & boost your immunity WITHOUT strict dieting! Unlike other weight loss products, SLIMMER does not contain laxatives or stimulants. It's made with 9 powerful metabolism-boosting superfoods. It's simple, it's safe, and it works! Trademark Declarations: Essentra® Trim is a trademark of NutraGenesis and is protected under U.S. Patent 6,153,198 & 7,318,938. Crominex® 3+, Capros® and PrimaVie® are registered trademarks of Natreon, Inc. Caution: Because this product may lower blood glucose, consult your healthcare provider before taking this product if you are taking blood glucose lowering medication. Blend, shake, or stir 1 teaspoon (1 scoop) of SLIMMER into 8 fluid ounces of water, ideally 30 minutes before meals. SLIMMER can be taken up to 3 times per day. Start with one serving of SLIMMER in the morning for the first three days. If you have a substantial amount of weight to lose, it might be beneficial to drink SLIMMER at breakfast and again at lunch. The key to success with SLIMMER is consistency and persistency. VITALITEA is one of the most powerful detox teas available for micronutrient delivery and elimination of undigested waste in your colon and your digestive system. VITALITEA is filled with compounds from plants that gently cleanse your digestive system and support your health with naturally occurring phytonutrients, high antioxidants, and known healing herbs. Steeping VITALITEA for up to twelve hours, although steeping for just a couple of hours will also work, creates a phytonutrient rich cocktail for your cells. The longer the herbs steep, the more vitamins and minerals that will be extracted. Bring 4 cups of water to a boil and remove from heat. Add 1 teaspoon of VITALITEA to the heated water, cover, and steep at least 2 hours or overnight. Add sweetener or lemon to taste. Refrigerate. The tea can be consumed hot or cold. Drink all 4 cups of VitaliTea before 4:00 pm.